Prasannia lives in Kottakarai with her family. Her father is a tailor and her mom works for an Auroville activity. 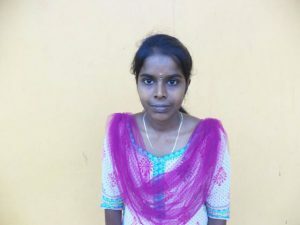 The engineering course that Prasannia has chosen is too expensive for them, her college is in Chennai and she has to stay in the colleges’s hostel. Prasannia has finished highschool with a score of 95% and her first semester in college with 9 out of 10 points. She is pursuing a Bachelor of engineering in Electronics & Communication. Prasannia is not only smart but can communicate well and she seems very eager to pursue a career, so one day she can provide for her family and make them more comfortable. Prasannia lebt mit ihrer Familie in Kottakarai. Ihr Vater ist Schneider und ihre Mutter arbeitet in einer Handwerks-Initiative in Auroville. Den Ingenieur Studiengang, den Prasannia gewählt hat, können sich ihre Eltern nicht leisten. Zusätzlich kommen Unterbringungskosten auf sie zu, da das College in Chennai ist. Prasannia hat einen Abschluss in der Highschool von 95% und in ihrem ersten Collegesemester hat sie 9 aus 10 Punkten erreicht. Sie studiert Bachelor of Engineering in Electronics & Communication.